Artist Heather Pant has been painting in Acrylics and Oils much of her life and professionally for the past 20 years. Enjoy her unique style and magnificent use of color as you escape into one of her many mountain scenes of Rivers, Lakes, Peaks, and Waterfalls in Majestic and inspiring Canadian Wilderness. "I Live to Paint and I Paint what I Love"
Living in Calgary Alberta and originally from Chicago Illinois, for me as an artist, the close proximity of the prairies, foothills and mountains of Alberta and British Columbia provides me with a never ending source of inspiration to be creative. Heather’s motivation and inspiration come from the movement and colors of her surroundings. Her use of bold vivid colors and movement provide the viewer with a truly introspective experience, evoking a distinctive sense of emotion through her creations on canvas. Heather Pant is an accomplished computer graphic designer, with extensive experience in advertising and marketing. 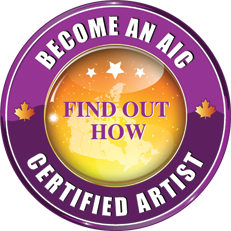 As a member for many years of the Chicago Artist Coalition she has participated in numerous solo and public art exhibits both in Canada and the US. Her Paintings are collected internationally and are held in both corporate and private collections. As a resident of Calgary she would like to share with you her body of work and appreciation for Alberta and British Columbia's beauty, color and textures. Heather also annually donates select pieces of her work in support of the Juvenile Diabetes Research Fund, Kathy's Run in support of fighting and finding a cure for Pancreatic Cancer. "I am always available for custom commission pieces. I can work from your photos, visions and ideas. Each piece is an original and unique creation for the collector. Please contact me or any of the galleries representing my work for further details."